I’ve been under the weather for the past couple days. 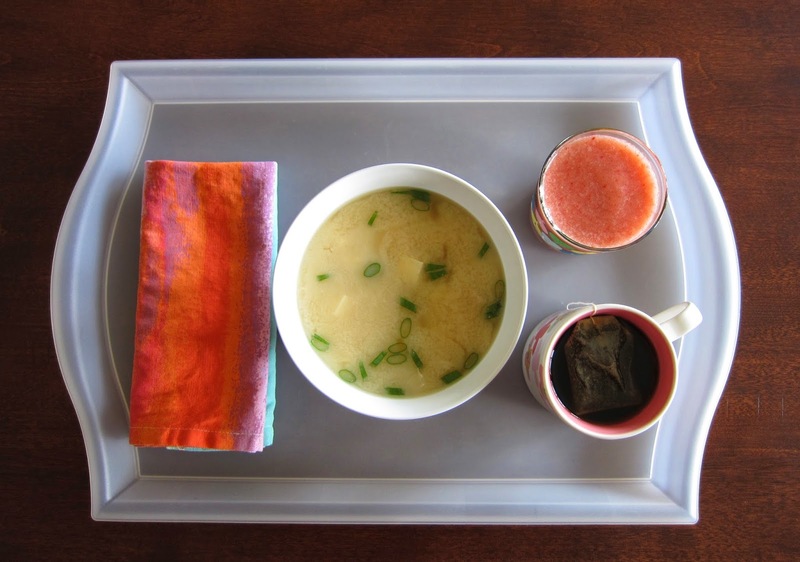 I try to consume as many fluids as possible in order to to stay hydrated, and I’ve got a few standard go-to comforts when I’ve come down with a cold -- brothy soups, Emergen-C and lots of hot tea (caffeine-free peppermint’s my favorite). Smoothies like this one are also pretty great, and I’m drinking this particular blend in hopes that it does keep the doctor away and that I’m back to good in no time. Y’know that broiled salmon I made a while back? Turns out the miso marinade from that recipe also tastes pretty flippin’ good with tofu and asparagus! Baking tofu is a relatively new thing in our house, but lemme tell you, it is wonderful because it comes out of the oven toasty on the outside and soft on the inside. Give it a try! Preheat oven to 425 degrees and mist two cooking sheets with non-stick cooking spray. Whisk first six ingredients together in large bowl. Working in batches, add a few tofu cubes to bowl at a time, stirring gently with slotted spoon. Use spoon to remove tofu from bowl, allowing excess sauce to drain back into the bowl, and arrange cubes, in a single layer and so that they’re not touching, on one of the coated baking sheets. Put tofu in oven and bake for 15 minutes. Remove sheet from oven, flip tofu cubes, and continue baking for an additional 15 minutes. 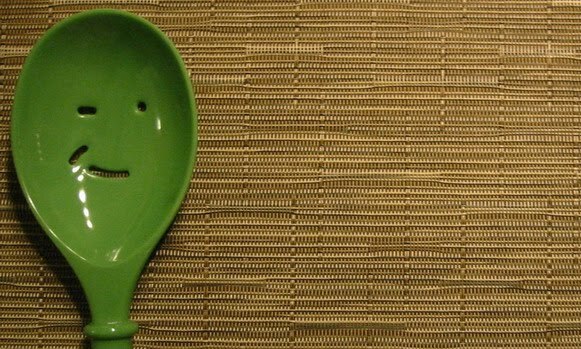 Use slotted spoon to mix asparagus with remaining miso sauce until lightly coated. Distribute asparagus on second baking sheet. Put asparagus in the oven 10 minutes before the tofu’s done, and everything is ready to serve at the same time. 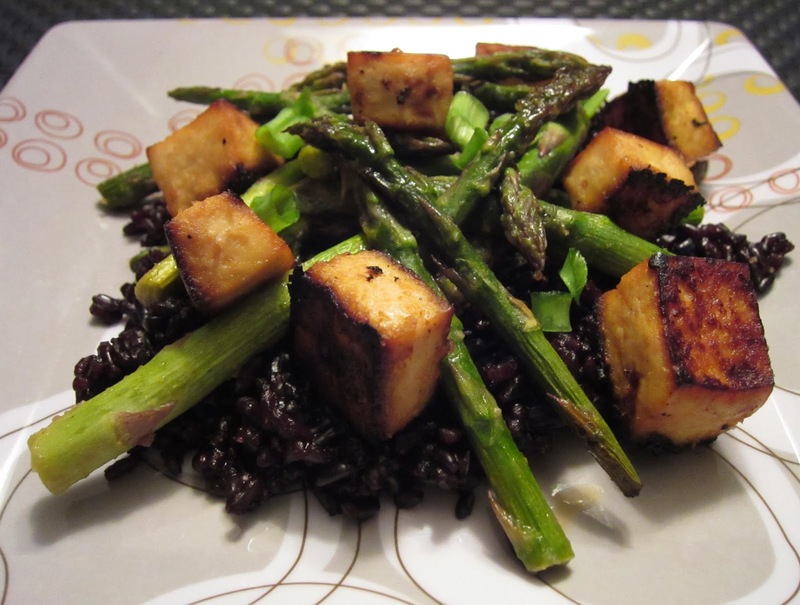 Divide rice evenly among four plates or bowls, then top with asparagus and tofu, and garnish with green onion. 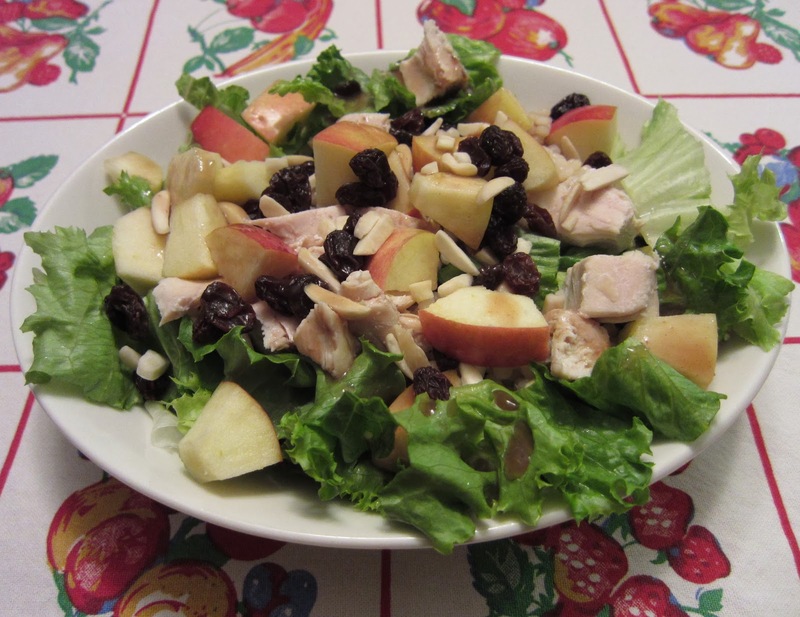 This salad has got a lot going on -- it’s crunchy, chewy, sweet and tangy. It’s also got a great make-ahead quality to it (just keep the balsamic vinaigrette in a separate container), so it's perfectly portable for the next time you feel like dining al fresco. Combine ingredients in a bowl, drizzle with balsamic vinaigrette, and enjoy.